The Scary Door is a science-fiction horror television program in the 31st century. It is a spoof of the classic science-fiction TV series The Twilight Zone, and references several other TV shows and films, including the ending of War of the Worlds. 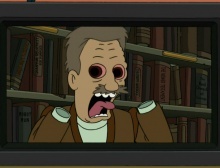 Seven episodes of The Scary Door have so far been seen in Futurama media. 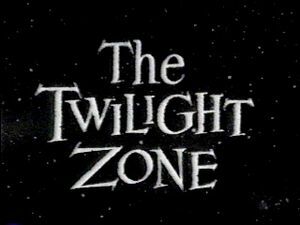 The title card to the 1960's series The Twilight Zone. While referencing multiple shows and films, the main reference to The Scary Door is the classic TV series The Twilight Zone, famous for its dramatic stories with big twists by the end, often revealing that everything was entirely the other way around of what one would have expected, or introducing extreme irony; for example in Time Enough At Last, a man who loves reading enjoys the fact that he is the sole survivor of human race as he finally gets time to read - but then he breaks his glasses. Most obviously, the opening sequence to the two are very similar: the camera drifts through space, with several strange objects flying around, with a host (originally Rod Serling) introducing the viewer to the strange area of The Twilight Zone (or in Futurama's version, one enters The Scary Door). While some episodes clearly are references to specific episodes of The Twilight Zone (for example Last Man on Earth, which has almost the exact story as Time Enough At Last but takes it a bit further in irony), others are less specific. The Gambler has multiple references to episodes of The Twilight Zone, as well as a lot of original scenes. Others, such as The Most Evil Creature of Them All, are not specific references to episodes but rather mockery of the show overall, which sometimes is extremely overdramatic and always have a twist. The soundtrack is also very similar, including the dramatic twist music in every episode. Episode 1, "The Last Man on Earth". Announcer: You are entering the vicinity of an area adjacent to a location. The kind of place where there might be a monster, or some kind of weird mirror. These are just examples; it could also be something much better. Prepare to enter: The Scary Door. Announcer: As per your request, please find enclosed the last man on Earth. Man: Finally, solitude. I can read books for all eternity! Man: It's not fair... [panicked] it's not fair! [calmer] Wait, my eyes aren't that bad; I can still read the large-print books. Man: [hysterical] It's not f-... [calmer] Well, lucky I know how to read Braille. The Twilight Zone episode Time Enough at Last. Announcer: You're entering a realm which is unusual. Maybe it's magic, or contains some kind of monster... The second one. Prepare to enter the Scary Door. Announcer: Please send the man 'round back and pick up Clyde Smith. A professional gambler who's about to have an unfortunate accident. Clyde: [laughs] A casino where I'm winning? That car must've killed me; I must be in heaven! Clyde: A casino where I always win? That's boring. I must really be... [dramatic] In hell! Sebastian Cabot: No, Mr. Smith, you're not in heaven or hell. You're on an airplane! Clyde: There's a gremlin destroying the plane! You've gotta believe me! 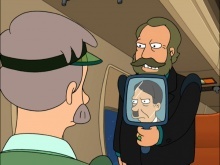 Clyde: Eva Braun, help me! The Twilight Zone episodes Nightmare at 20,000 Feet, A Nice Place to Visit, and The Man in the Bottle. The casino name is itself a reference to Twin Peaks, itself referencing the western "One Eyed Jack, written by Rod Serling. Episode 3, "The Most Evil Creature of them All". Announcer: You're on a scenic route through a state recreational area known as the human mind. You ask a passer-by for directions, only to find he has no face or something. Suddenly up ahead, a door in the road. You swerve, narrowly avoiding The Scary Door. Scientist: I have combined the DNA of the world's most evil animals to make the most evil creature of them all. Naked Man: It turns out it's man. This episode was originally a deleted scene from "The Birdbot of Ice-Catraz". Episode 4, "First Degree Irony". Announcer: Imagine, if you will, a three by seven inch wooden frame -- a frame that's a gateway to a world of imagination. Wipe your mind on the welcome mat. You're about to enter The Scary Door. Announcer: Meet Brad Thompson, a man on his way home from a boring day at the office. Brad: Man, I wish something exciting would happen... anything at all. Brad: What's this? A fire truck is trying to pass me? To get to my neighborhood? I'll bet my neighbours house is on fire. I'd better speed up if I want to watch that. Brad: Wait a minute. My neighbour's house isn't on fire. But then, what's with all the smoke? 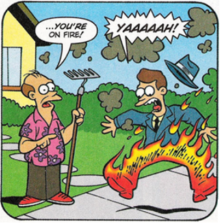 Man: Oh... hi Brad, sorry to be the one to have to tell you, but... you're on fire! Fireman: We tried to warn him that he was spontaneously combusting, but he drove away from us. Announcer: Official cause of death, third degree burns... actual cause of death, first degree irony! Episode 5, "That Humblest of God's Creatures". Announcer: Imagine, if you will, an announcer you can barely understand. He refers to a [mutters], but you're not quite sure what he said. He seems to be eating something, or perhaps he's a little drunk. It's remotely possible that he just said something about the Scary Door. Private: It's all over! Our guns and bombs are useless against the aliens. Farmer: The saucers! They's a-crashin'! Announcer: In the end, it was not guns or bombs that defeated the aliens, but that humblest of all God's creatures, the Tyrannosaurus Rex. Episode 6, "The Aliens Are Among Us". Announcer: You're taking a vacation from normality. The setting: a weird motel where the bed is stained with mystery. And there's also some mystery floating in the pool. Your key card may not open the exercise room because someone smeared mystery on the lock. But it will open the Scary Door. Announcer: Submitted for your Emmy consideration: a popular Senator with unpopular ideas. Man: Oh? How can you be so sure them aliens aren't already among us? Episode 7, "Be Careful What You Wish For". The Scary Door narrator: Enclosed is a .pdf attachment, a picture of yourself in a boat on a river. It's a river that flows in two directions. Make that three. It's a magic river. That's how. It is flowing down the eerie canal to... The Scary Door. That's eerie with two Es. [C.U. : On TV, a scientist's laboratory. The scientist finishes welding a Robot.] Consider, if you have the energy, Dr. Daniel Zenus, an inventor with a terminal case of the lazies. Dr. Daniel Zenus: This Robot will do everything for me! Robot, activate yourself and do my research. Dr. Daniel Zenus: Next, assume my social obligations. Official: Dr. Zenus, for a lifetime of scientific achievement, we present this award to... Your Robot! Boy: Daddy, I love you! Dr. Daniel Zenus: If only I'd programmed the Robot to be more careful what I wished for! Robot, experience this tragic irony for me! In the Comic-Con reading of this episode, LaMarche was the voice of Dr. Zenus as well as the announcer and Billy West did the voice of the robot. The comic "Let's Twist Again" reveals that the ideas for The Scary Door come from an alternate universe where everything is ironic and there is only one writer for the show. The third episode which appears behind the ending credits of "Spanish Fry" was originally going to appear in "The Birdbot of Ice-Catraz", but the scene was deleted. One episode was seen in each of the first five seasons, including one in the four movies that encompass season 5. 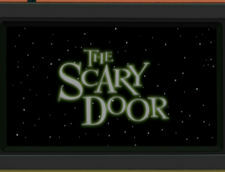 Season 6, however, includes two episodes of The Scary Door. This page was last edited on 30 July 2018, at 20:28.